A quick update with a few pics for you guys today. 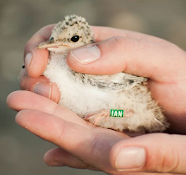 Lots of new nests found over the past few days with the tallies now reaching 36 active Little Tern nests with 86 eggs! The bulk of these (31) are found in the main K-colony whilst 5 nests are located south of The Breaches in the sub N-colony. No more losses to corvids since my last post but a Hooded Crow continues to hang around the very southern limits of the colony whilst a juvenile Rook is being a bit of a nuisance around the north, thankfully the terns are still giving both of them a hard time! Lots more action from other predators around the area though. A male Peregrine has made a couple of attempts at catching adult terns but remains unsuccessful, a male Kestrel has been hunting lizards in the dunes right inside the K-colony fencing & is getting a lot of grief from the terns for it, a Buzzard even soared right over the colony a couple of days ago, causing a bit of a panic amongst the terns & there's a least 3 Foxes patrolling the fields inland from the colony with one in particular out & about early in the evening. No sign of any Hedgehogs....yet! We've had to be mindful of the current high tides (as a result of the full moon), as the seaward section of fencing & low nests are vulnerable if strong easterly winds were to coincide. Although the wind has been strong all week, thankfully it has been coming from the West-Southwest & should continue to do so up until the last high tide on Sunday. Two Great Northern Divers in full summer plumage offshore from The Breaches yesterday were nice to see, the Dunlin flock has reached 50+ over the past few days & the largest flock of migrating Sanderling recorded was of 24. The Otter continues to be seen, mostly at night however.